An Introduction to Middle English Literature. A beginner’s guide to the treasures of medieval English literature. An introduction to the wealth of the English language and its literature following the imposition of French as the language of establishment in 1066. We shall see how English appears to have “moved out to the country”, where it flourished to re-emerge with all the timeless vigour of human life that bursts out from the pages of Geoffrey Chaucer’s Canterbury Tales. 10.15 English Old and Middle – a look at the changing character of the English language and literature before and after 1066. 11.30 The Cult of King Arthur – a reassessment Layamon’s Historia Bruttonum, the first English version of the legend of Arthur. 14:00 Merry England Relocated - an introduction to the Geoffrey Chaucer’s Canterbury Tales. 15:15 Timeless Comedy – A reconsideration of The Miller’s Tale. After early experiences in archaeology, Sam Newton graduated from the University of East Anglia with a first in English Literature in 1983. He was awarded his Ph.D. in 1991 and published his first book, The Origins of Beowulf and the pre-Viking Kingdom of East Anglia, in 1993. Since then he has worked as an independent scholar in Wuffing and Early Medieval Studies. His latest book, The Reckoning of King Rædwald, was published in 2003. He is also now a Director of Wuffing Education and Time Team historian. Barber, R., King Arthur: Hero and Legend (London 1961). Bennett, J.A.W., & G.V.Smithers, Early Middle English Verse and Prose (Oxford 1982). Brooke, C., The Saxon and Norman Kings (Glasgow 1963). Coghill, N., The Canterbury Tales (Penguin Classics 1960). Davies, R.T. (ed. 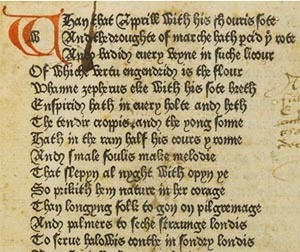 ), Medieval English Lyrics (London 1966). Mason, E., Wace & Layamon - Arthurian Chronicles (London 1962). Poole, A.L., Domesday Book to Magna Carta (Oxford 1955). Thorpe, L. (tr. ), Geoffrey of Monmouth - The History of the Kings of Britain (Penguin Classics 1966).